This last week marked 50 years of Star Trek, Gene Roddenberry’s vision of humanity in the 23rd century. As a Trekkie, I’ve enjoyed multiple viewings of all five television series (sans the animated series) and the movies. Each series reveals a piece of our human story. There’s much to see in our evolution just since the debut of The Original Series (TOS) on September 8, 1966. Through its exploration of outer space, the five series with its writers and characters expanded our notion of human nature. For Learning and Development professionals we can use the series’ arc as a window into society’s changing cultural roles, needs, and learning. 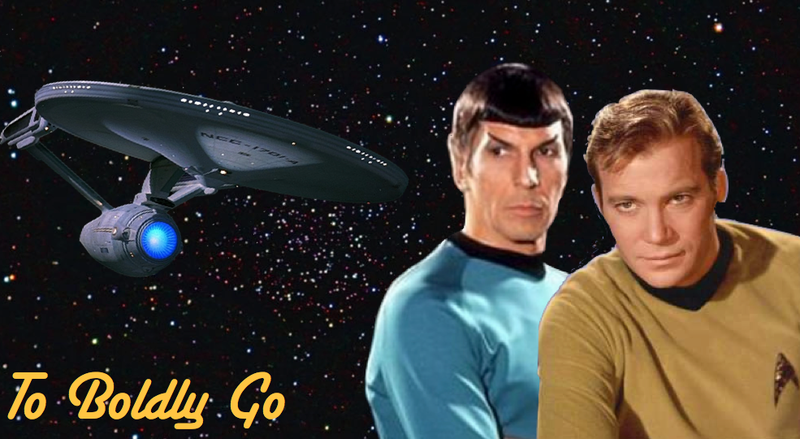 This blog examines our view of leadership as it manifested through Star Trek’s universe. In part two, I will explore our view of Women, of Outsiders, and of Diversity. The Original Series (TOS): 1966-69. TOS, set in 2266-69, set the tone. It began the five-year mission to define serious science fiction, compelling space allegories, and challenge our notion of what might be possible for humans in the future. It triumphed because it tackled such essential and eternal themes as prejudice, war, learning, and love. 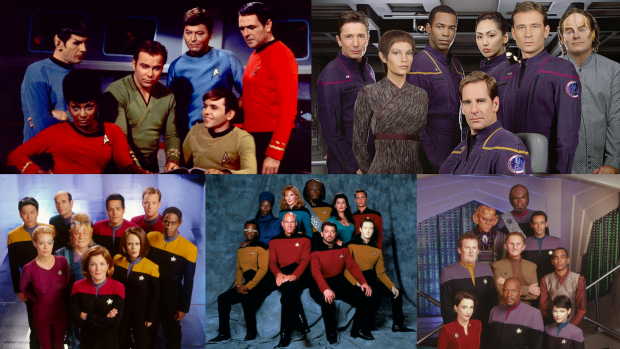 Clockwise from upper left: casts from 1) The Original Series; 2) Enterprise; 3) Deep Space Nine; 4) The Next Generation; and 5) Voyager. The Next Generation (TNG): 1987-94. TNG is set nine decades after TOS, 2364-2371. TNG continues the mission, exploring the complexity of cultures, of each species, the intricacies of science, and a fuller philosophy of life and potential. Deep Space Nine (DS9): 1993-99. DS9 is set in 2369 to 2375, it overlaps TNG, and takes place on a space station rather than a starship. The crew handles rival alien species who want control of DS9 because of its strategic position to a wormhole, which allows speedy travel to the far reaches of space. Storyline engages diverse species, spiritual beliefs, and a darker version of the Federation. Voyager: 1995-2001. Set in 2371 to 2377, Voyager overlaps with DS9 and becomes lost in space 70,000 light years into the “Delta” quadrant, or 75 years from home. The series chronicles the crew as it travels across an unexplored region of the galaxy, encountering new species and cultures, on their way back home. Enterprise: 2001-05. Set in 2151-55 more than 100 years before TOS, this prequel takes place on the USS Enterprise NX-01 – the first warp 5 starship capable of planetary travel – weaves the history of interplanetary upheaval that eventually leads to the formation of the Federation. Kirk’s Captain, a ladies man of the 60’s. Captain Kirk: The best of the Charismatic or Heroic Model available from a 1960’s perspective of leadership. Kirk models the best traits of John Kennedy, Lee Iacocca and Steve Jobs: courage, duty first, and to be out front. In nearly each episode, the charismatic Kirk uses heroic language: “I could’ve prevented all of it; I should have known better; it’s my duty and responsibility,” even when he couldn’t prevent unlikely accidents. At times, Kirk seemed to need McCoy or Spock to remind him he was human, a common occurrence for Heroic leaders, who seem bigger than life. 1. Listening receptively to what others have to say. 2. Acceptance of others and having empathy for them. 5. Having highly developed powers of persuasion. 6. Ability to conceptualize and to communicate concepts. 7. Ability to exert a healing influence upon individuals and institutions. 8. Building community in the workplace. 9. Practicing the art of contemplation. 10. Recognition that servant-leadership begins with the desire to change oneself. Per Greenleaf, Servant Leadership “begins with the natural feeling that one wants to serve … Then conscious choice brings one to aspire to lead.” The desire to serve manifests as stewards, mentors, and moral guides. Picard embodies these qualities, demonstrated well in these TNG episodes, Relics, Pen Pals, Final Mission, The First Duty, The Measure of a Man, and Ethics. Captain Sisko: As the first Black Captain of a Trek series, Benjamin Sisko leveraged Picard’s model of leadership, offering fans a different vision for command. More than others, he functioned as a Transformational Leader, appealing to possibility beyond the ordinary. His leadership bridged worlds: between quadrants of the galaxy, species, and cultures, between solids and shape-shifters, between past and future, and between realms of existence. Sisko’s role is a balance between commanding a space station and serving as “emissary” to the Prophets, a spiritual role for the Bajoran species. The first episode, Emissary, foreshadows much of Sisko’s journey in accepting this role and then surrendering to it. As a transformational leader, Sisko, himself, transcends into something much bigger than himself. From L to R: Captains Kirk (TOS), Picard (TNG), Sisko (DS9), Janeway (Voyager), and Archer (Enterprise). Captain Janeway: Katherine Janeway’s captain – Collaborative and Visionary – as the first woman in the Chair, is struck with fundamental challenges from the first episode, The Caretaker. First, Janeway’s crew captures a band of insurgents, The Maquis (renegade Federation officers resisting the alliance with another species, the Cardassians). With insurgents in tow, an accident thrusts both ships 70,000 light years into the Delta Quadrant (75 years travel). Janeway fashions a single crew, selecting the insurgent leader as her first officer; then, forms a unified purpose that can endure a multigenerational journey. She forges alliances everywhere: within the crew, and with unsavory species, most of whom do not honor the Alpha quadrant norms or values. Each episode finds Janeway adapting to unpredictability: she revisits her mission, revises the course home, integrates new species into the crew while keeping her values, regardless of the unruly species, and wild-west-like situations she encounters. Captain Archer: Johnathon Archer arrives last in the series, developing the formative years of the Federation. As such, this series reveals in real time (early part of 2000s) as it romanticizes the techie, start-up, entrepreneurial spirit, of our day, with Archer representing the entrepreneur and the wild-west, explorer, as apparent from the first episode, Broken Arrow. Archer displays a combination of geeky and child-like playful exuberance in the exploration of space. Over the series, Archer discovers the unruly nature of space and the vast array of new species. The series speaks to likely prejudices that arise when human exploration confronts the unknown. Archer grows to respect the wisdom of elder species (Vulcans) and embraces the leadership thrust upon him. Adopting an entrepreneurial model, Archer eventually grows into Janeway’s visionary leader. It’s been years since I viewed all 79 episodes of TOS back to back. Viewing about 50 hours for this piece, I am struck by our evolving nature of leadership during the two decades between The Orginal Series (TOS) and The Next Generation (TNG). Consider captains Kirk and Picard in similar situations: In the TOS episode, The Deadly Years, Kirk was infected with radiation that caused rapid aging. The episode’s tension was built around Kirk’s unwillingness to give up command as he suffered — physically and mentally — from an evidently debilitating affliction. In a similar TNG episode, Rascals, a transporter glitch reverted Picard’s body to that of a child’s (not effecting his mind). He voluntarily gave up command when discussed with Chief Medical Officer, Dr. Beverly Crusher. Americans pine for the mythic hero leader; just ponder this year’s American presidential election. We keep reaching back for the “tough, individual, take-charge, heroic model,” in an interconnected, complex world that demands mutual interdependence to empower leadership system-wide. The imagination in 1987 by TNG writers projecting a 21st-century leadership possibility – that has just now begun to emerge – was uncanny. To appreciate this point, it is important to note the role writers and directors played in both series. TOS captured our imagination focusing on advanced technology and cultural diversity. But, it remained tethered to 60’s earth when it came to gender roles and human development as manifesting in communications and leadership, and even fashion (note the miniskirts for women, viewed in the 60’s as “liberating,” and now as “objectifying”). This changed in TNG, as Picard took a quantum leap in adopting a completely new leadership model. In TOS leadership resided only in Kirk as captain, while TNG used Picard to highlight leadership in others. This graph notes season by season the percentage of episodes per season where leadership, located in the Captain, was central to the storyline. Picard’s Captain was not the sole leader or central figure. Indeed, we learned about Klingons and came to appreciate warrior species/races through Worf; acknowledged emotions, sensing and valued listening through Deanna Troi and Guinan; became immersed in engineering, science, and learned acceptance though Geordi La Forge (who wore a prosthesis to recover his eyesight). We also explored childhood wonder and genius through Wesley Crusher; embraced scientific curiosity, medical research, and compassion through Beverly Crusher, who also offered parenting insight; and, navigated command styles, cultural mores, and pondered the meaning of life through Will Riker, Data, and Picard. Together, this cast imagined a wholly new humanity where leadership didn’t reside in an individual or single role. Even the Command Bridge included several chairs, alongside the Captain. The bridges on each Enterprise L to R: Original Series with the captain’s chair in the center; TNG with its set of triple command chairs. A significant difference between the first two series involves the way TOS seemed to develop stories from current or past Earth narratives, and TNG challenged those narratives to imagine new ways of being human. Through TNGs stories we see ourselves evolving not only in technology, science and space travel but also evolving inward, transcending current desires, drives and expanded awareness to being with others more fully. TNG opened up what it means to lead, and what it means to be captain, informing Captain’s Sisko and Janeway as they expanded and deepened Picard’s model. Sisko embraced Picard’s moral compass and stewardship to command the unsavory characters’ coming through Deep Space 9. Janeway embodied a moral compass and mentorship to bridge differences and inspire what seemed to be the impossible from her crew. Still, Roddenberry’s Universe begins with The Original Series (TOS). It was Kirk’s captain who went boldly where no one had gone before to claim a new audacious future. Roddenberry’s entire universe (now available on Netflix) reveals an important leadership arc that integrates the best of our science and soul – called forth from a future for us to explore today. My next post will explore how Star Trek expanded our view of Women, Outsiders, and Diversity.